Second grade was an interesting growth period for me. There were so many things in the world that interested me. I had a great monster card collection, a fairly decent rubber bug collection, and an imagination that drew fun and excitement from the very molecules of endless thought. As a second grader, I'd charted islands and navigated corners of the earth unknown without ever leaving my secret hiding place behind the sofa. I was a jungle adventurer, soldier, cowboy, and quite unfortunately, a student. For Christmas that year I'd received a "Jungle Jim Safari" set. (To this day I cannot find a pic of it!). 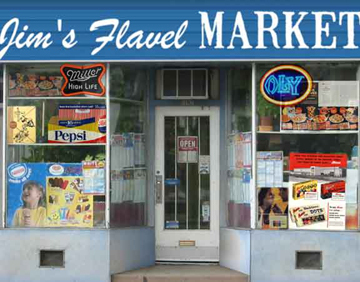 My parents shopped at a local grocery store called Tradewell. On the very top shelves far above the food items, giant toys were stored to tantalize us kids once Christmas time was near. The "Jungle Jim" set had a hunting rifle, canteen, pith helmet, and a flashlight. TV was fantastic too. My favorite show on Saturday morning syndication was Sky King. I also used to watch Bomba the Jungle Boy, Superman, and many cartoon favorites. I used to love (and still do), cartoon greats like: Hokey Wolf, Yakee Doodle and Chopper, Jinx the cat, Pixie and Dixie, Rocky and Bullwinkle with lovable characters like the sinister Boris and Natasha and the unforgettable Biggy Rat and Itchy Brother. And what about those wonderful school supplies? Didn't the Art gum erasers smell so good? It's a given fact that Art gum erasers were meant to be thrown at people's heads when they weren't looking. Didn't the white school paste taste minty-fresh and good? My brand: LePage's white; Fewer calories, less fat. The plastic pencil boxes were also really cool. I had a red one. 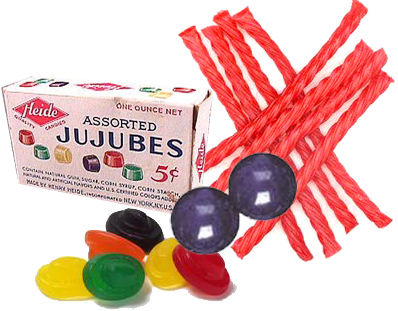 Tootsie Rolls and Grape gumballs fit inside nicely. Rulers were only good for holding down on the edge of your desk and then flipping the hanging end like a diving board to get that cool vibrating sound. Pink Pearl erasers were good for anything but what they were intended for. You could stick pins in them and make great spaceships. Crayons were the ultimate. My favorite color: Blue-Green. Coloring, and coloring books guaranteed me hours of delight in front of the TV. Just like life, It was difficult at times, but best to try and stay within the lines. Remember these rubber boots with the snap clips? They kept your feet so warm in the frigid temps. One of my first writing tablets. These Big Chief tablets were great. I had traded my cattle truck for this magnificent snow plow. I traded with a school friend named Dana . I was sure in my second grade mind, that his name was actually "Dino". It really took some months before I permitted my mind to make the adjustment. I also used to love those old black rubber boots with the metal snap clasps. They were very comfy and warm, but most importantly, they were like combat boots that the soldiers wore. They were just black instead on olive drab. It was wonderful to be able to stomp through puddles knowing my feet were warm and dry. It's pretty easy to see where my mind was at during the third grade. I was uniquely focused on just about everything but school. My feeling was this: if you had to be there, you might as well go prepared. 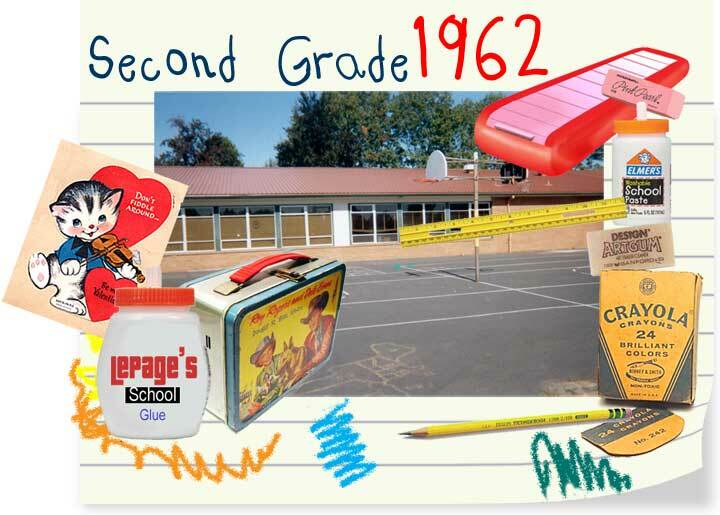 That's why I remember stopping at the corner store with the guys to load up on licorice, grape gumballs and other goodies that the school cafeteria did not stock. Remember when penny candy was still a penny? Such value was to be had for so little cash. We all ate Luden's Wild Cherry cough drops and Smith Bros. black like they were candy, because basically,that's what they were. The picture at the right was our view of the Joseph Lane Cafeteria from the playground. School lunches were pretty cool. I would get real hungry trying to digest math, but thinking only of food. I always preferred our school's "Meat Loaf Mondays", but just about everything they made was good. Perhaps it was the mystique of having it professionally prepared instead of mom dishing it up at six o'clock every evening. 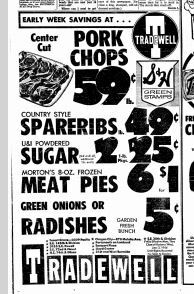 The lunches in 1963 cost around 25 cents. Milk was a 3 cents. In the mornings, the radio station would announce the school lunch for the day. They always made it sound so much better: "Today, the Portland Public Schools lunch menu will be meat loaf dinner with carrot wedges, green bean slices and corn with raspberry gelatin and cream dessert." 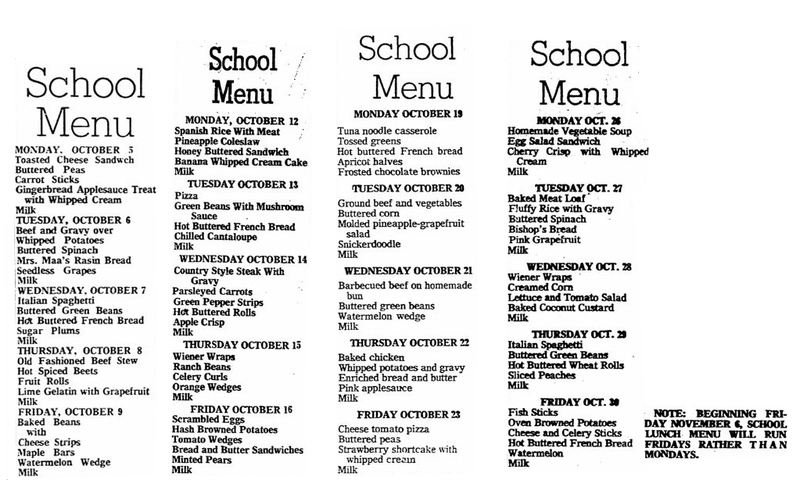 Check out the official school lunch menus for the month of October 1964! By third grade, we had moved into a house on 96th Ave. just off of Bush Street. This is the house and the time that carries the most profound and wonderful memories of my life. The area has since been swept away by the freeway that is now known as I-205. I still feel very sad about this, because there is no way to go back again and just re-capture memories. Many new discoveries were just around the corner. I received an allowance of $2 a month which I promptly spent in the toy basement at Newberry's at Eastport Plaza. Eastport was probably the first mall in SE Portland. Our house sat directly behind Barlow Elementary School. From our backyard, we looked out at the playground. My mom and I made our first garden behind the garage. We hoed and raked the dirt until it became a fine powder. I remember pulling up carrots long before they'd matured, just to munch on them. Coming from the dirt made them more special than any store-boughts in town. We also had three fruit trees, apple, pear, and plum. Our house sat on a gravel road at the crest of a steep hill that eventually led to Powell Blvd. During the fall of 1963, I was lured by amazing cover painting of my first encounter with "The Hunchback of Notre Dame". I can recall that it was the most amazing, life changing thing I'd ever encountered before. There is more to this story here. This model only enhanced my already burgeoning obsession with monsters. I was the beginning of a life-long love affair with Aurora Models. I also discovered these unique plastic horror figures at Newberry's. They came molded in these bright glowing colors. They sold for 10 cents apiece. There were also 5" army men that also sold for the same price. I really miss those old figures. 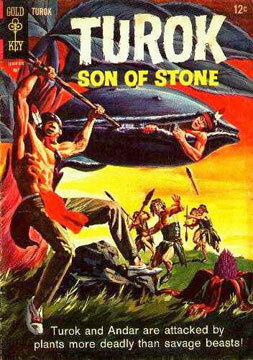 "Turok, Son of Stone", was the first comic book I ever purchased. Usually, I just traded army men, or other odd things for them until I got a stack worthy of trading back and forth. Once I saw the cover of this comic, I had to have it! I can even remember now, what it was like buying it. Ever since, Gold Key Comics have been my favorites. The Beatles '65 album brings back super strong Christmas memories for me. I think I must have played "She's a Woman" a billion times.